How to Fix MS SQL Server Error Message 823? How does SQL database get corrupted? Let us first understand the major causes of SQL database page level corruption and later move on to the diagnosis or resolution process. Hardware malfunction: Monitoring server, hard disk, and PC components regularly could help in avoiding this issue. Sudden power failure: Power supply to the database should be timely checked when the database is in running state. The unexpected power cut could be a reason for corruption. The infected setup files: Be alert while downloading a new software and check whether the setup files are adequately scanned and are free from virus or malware. Irrelevant update installation: Avoid installing updates that seem trivial as they might cause corruption of SQL database at page level. Check the difference between an original and the corrupted file using a text comparison software. Execute DBCC CHECKDB command on the damaged file. This command performs a systematic data integrity check and identifies the issues. Now, execute DBCC PAGE command after switching on the trace flag 3604 (for this run DBCC TRACEON command). It will examine infected page content. Here, filenum and pagenum are page ids. Now, run the command ‘SELECT * from dbo.tablename’. This command is for confirming the page number and. Now, you know the location where corruption has taken place. Use the text comparison software to compare it with original page. Finally, fix the corrupted page after detecting flaws from the previous step and then, execute the DBCC CHECKDB command on the restored file. Do you find the DBCC PAGE method challenging? The DBCC PAGE method is challenging as it requires experience and in-depth knowledge of the SQL Server to execute it efficiently. When some pages of the SQL server database are highly damaged, making direct changes to files may lead to further issues as well. So, it is recommended to use a third-party tool to repair corrupt MDF/NDF files. The best software advised by IT professionals and experts to resolve SQL page-level corruption is Kernel for SQL Server Recovery. It allows painless SQL Recovery from corrupt MDF/NDF files. 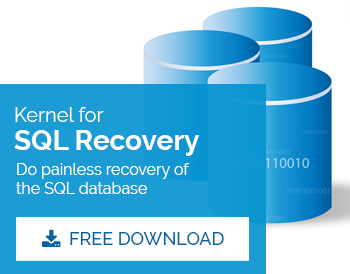 This tool restores lost database objects back to a running SQL server. It repairs database files of any version of SQL server. Hopefully, this post will have helped you in resolving page-level corruption issues with SQL server database. Follow any of the methods given here depending on your knowledge and experience. Write us your feedback in the comments section to serve you better.